It’s not often I dedicate a whole blog post to a shampoo – to me, a shampoo is a shampoo, is a shampoo. Most of the time. I decided to write this blog post (and feature the BIG Shampoo in a blog post of its own) because I’m thinking a lot of you guys feel the same way I felt initially about a shampoo like this specific one. Anyway, enough with the complaining about sea salt sprays! BIG Shampoo is NOTHING like that, and that’s why I’m doing this review. I think a lot of people don’t want to try this textured shampoo because they are scared the sea salt will dry out their hair and leave it feeling sticky. I have no idea what magic went into creating BIG shampoo but LUSH really hit the ball out of the park with this one! LUSH uses an infusion of seaweed and lemon in BIG (we’re just going to call it ‘BIG’ from here on out) – fresh, organic lemon & lime to cleanse the hair and give it a beautiful shine, and seaweed to nourish the scalp and soften the hair. Now, I know you’re worried that your hair is going to smell like seaweed – fear not, the scent of this shampoo is incredible (fresh & citrusy, with a hint of sweetness – almost like a Mojito). Seaweed is used because it is packed full of nutrients and it grows along the beaches in the UK (where LUSH products are born) plentifully so it is completely sustainable. Coarse sea salt gives the hair a boost from the roots and is packed full of minerals for the scalp. Sea salt also acts as a natural preservative, so BIG is free from synthetic preservatives. Neroli oil, orange flower absolute & mandarin oil are uplifting essential oils, which means, not only will your hair be lifted…but your mood as well. Coconut oil is also added because it smoothes the hair cuticle & ensures hair is soft and moisturised. BIG leaves my hair feeling super clean and clarified, it’s the perfect ‘once a week’ shampoo to deep clean the hair & remove product build-up. A little goes a long way (I only use about a teaspoon amount) and I like to massage the sea salt crystals around my scalp area initially and will then incorporate the lengths of my hair. BIG creates the most heavenly scented, rich lather and rinses out really well too, there are no salty crystals left in the hair after rinsing. I follow up with a good conditioner (since BIG does leave my hair squeaky clean) and my hair is left feeling weightless and airy, after I’ve styled it. My hair doesn’t feel dehydrated after using BIG (even though one would imagine the sea salt would dry out the hair), I think it’s the combination of coconut oil & all the essential oils that prevent dehydration. The graininess of the sea salt crystals is also good for stimulating the scalp to promote hair growth. I do think BIG will strip hair colours / dyes that require a lot of maintenance i.e. deep / bright reds & fun colours like blues, purples and pinks – but as a weekly treatment shampoo on blonde, brunette and dark hair it’s great! This is my second tub (I loved this shampoo so much I shared my first tub with a friend), and I must admit, BIG has become a staple in my hair care routine. 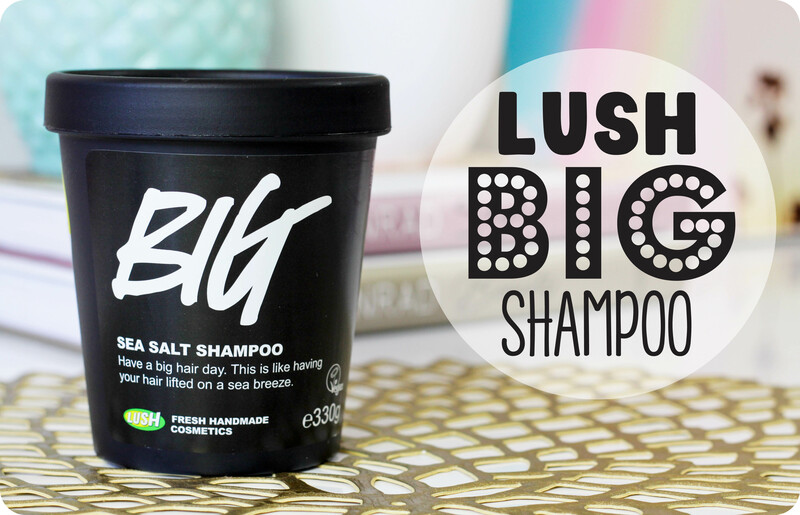 If you’re looking for an interesting, deep cleaning treatment shampoo that will leave your hair feeling bouncy and looking shiny – then invest in BIG. 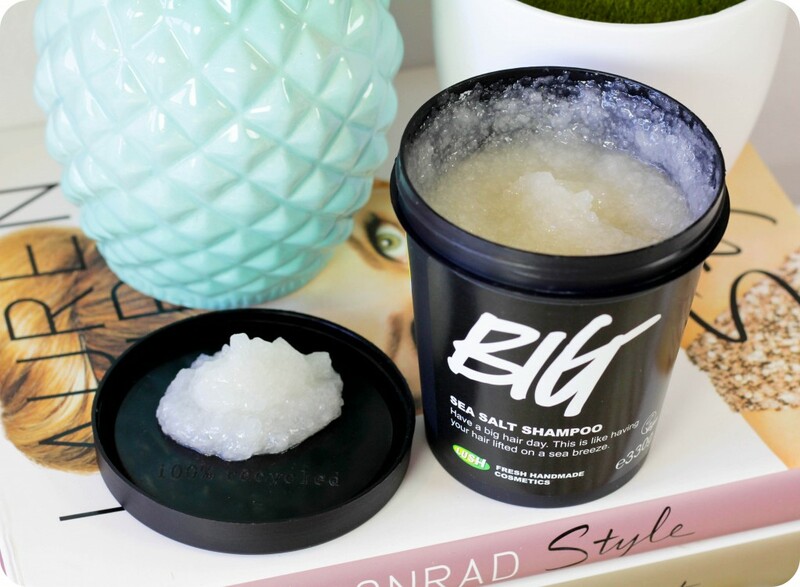 BIG Shampoo is suitable fo all hair types & retails for R 195,00 (330g) and is available in-store, as well as online in the LUSH South Africa online store. LUSH recently lowered their delivery costs (check out this blog post for more info on the new delivery costs), so there is no reason not to place an order online. As mentioned above, a little bit of this shampoo really goes a long way, so BIG will last you for ages. LUSH holds a special place in my heart because their packaging is 100% recycled (and recyclable), their products are Vegan, they fight the battle against animal testing, plus they like to keep their ingredients as natural as possible. Oh, and their products are super fun to use as well! Top Tip: Remember to return 5 clean full size (even the smaller size) LUSH pots or tubs to receive a fresh face mask for FREE! I was tempted to order online as I want to try the mask you mentioned previously, but heading to CT in 2-3 weeks so am planning to make a stop at Lush and do some damage! This shampoo sounds divine… Is it for all hair types? Wow this shampoo looks so interesting!! Sounds amazing. Can’t wait to try it out especially since my hair hasn’t been feeling all that great. Does the product contain any ingredients from the dead sea? I personally prefer to refrain from using items which contain such ingredients. Thank you so much for your kind words, Faatima! 🙂 Haven’t heard back from LUSH SA as yet, but will keep trying! This has a very unique formula for a shampoo. Thanks for the review.